Only a short blog post today as I am travelling for a fair part of the day on my way from New York City to Dublin for my next speaking engagement. Tomorrow’s blog post will cover some reflections on the 3-day Modern Monetary Theory (MMT) conference that finished yesterday in New York. There are several things I thought about the event, some of which I will share in public, the others, in private, with the organisers. But, today’s post, is a brief reflection on the latest crisis that is about to engulf the Eurozone. I am referring to the announcement by the Italian government that it will target a fiscal deficit of 2.4 per cent of GDP. The elites are up in arms. I hope that Italy holds its nerve. I will have more to say about this topic in the coming week or so but I thought the reaction by the press to the Italian governments release of its new fiscal plans was crazy. Essentially, the new Italian coalition government (Five Star/Lega) announced that it would deliver a fiscal deficit of the order of 2.4 per cent of GDP in the coming year. With Italy in a downward social spiral and degenerating infrastructure after years of austerity, the new government announced modest increases in spending. The outgoing government had committed to a fiscal position of 0.8 per cent of GDP this year (that is, more austerity) and a surplus by 2020. 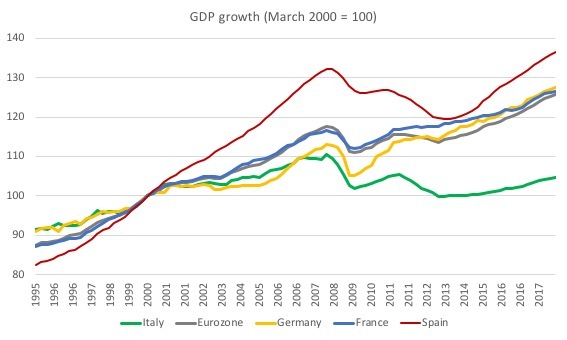 The first graph shows GDP growth indexes (March-quarter 2000 = 100) for the major Eurozone nations. Italy was more or less growing proportionately with the Eurozone aggregate up until the GFC. Thereafter, it has falling into stagnation and is only 4.7 per cent larger than it was at the time the common currency became law. Since the peak before the GFC, Italy’s economy has slumped by 5.3 per cent. The Eurozone overall has only grown by 6.7 per cent since the GFC onset (March-quarter 2008), Germany by 12.7 per cent, France by 8.3 per cent, and Spain by 3.3 per cent. So wherever we take the assessment from, the Eurozone has been a disaster for Italy. The next graph shows unemployment rates for the same nations since the March-quarter 2000. Germany is the outlier. 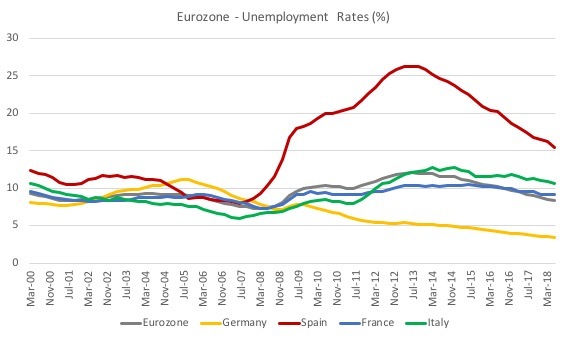 The other major Eurozone nations have failed to reduce their unemployment rates by any significant degree relative to where they were before the crisis began. Italy still has 10.6 per cent of its active labour force without work (and it is worse when we consider broader concepts of labour underutilisation. So what would a responsible government do in this situation? Answer: totally unambiguously, increase its fiscal deficit to stimulate new growth, particularly in employment rich sectors. The Financial Times editorial (October 1, 2018) – Italy’s political leaders are playing a dangerous game – is representative of the hysteria that has accompanied last week’s announcement by the Italian government that it was increasing the fiscal deficit target to 2.4 per cent of GDP. It carried a sub-heading “Fiscal irresponsibility and defiance could deepen Rome’s troubles”. There are real and serious risks, stemming as much from Rome’s attitude and behaviour as from the actual economic targets. Italy’s previous government committed last year to bring down its fiscal deficit to 0.8 per cent of gross domestic product by next year and gradually turn it into a surplus in the two years after that. While few thought this target was credible, the 2.4 per cent deficit the government signalled late on Thursday is way above the kind of figure the EU or the markets could reasonably live with. That ratio, moreover, would be sustained, not decreased, over the two following years. Rather than helping reduce Italy’s public debt — the eurozone’s largest, as a percentage of GDP, after Greece — the draft budget calls for potentially unsustainable spending. By the time these plans reach Brussels for formal approval, the targets may have grown looser still. Which makes you wonder what the Stability and Growth Pact (SGP) is all about. The allowable threshold is 3 per cent of GDP. And Italy has been in breach of the 60 per cent debt target for years so it is ridiculous to start imposing sanctions as a result of that on-going departure from the rules. Once could argue that a 2.4 per cent deficit is way below what is needed. Way below, given the sort of economic performance summarised in the two graphs above. … would be condoning truculent behaviour and economically misguided objectives. And that is why the Eurozone is so dysfunctional. Truculence is now defined in terms of trying to grow an economy that is already around 6 per cent smaller than it was 10 years ago. While the bond markets were pushing up yields on Italian government debt this morning, the reality facing the Eurozone is that the ECB will have to entere the markets and buy up Italian government debt, just as they did in 2012. If they don’t then there will be a major financial crisis which will threaten the Eurozone viability. I hope the Italian government doesn’t buckle under the pressure and pushes their national interests and ignores the pressure from Brussels. That will force the ECB to intervene and use its currency-issuing capacity to stabilise Italian government yields. It has the bargaining power here. Whereas Greece was too small and succumbed to the bullying by the Troika, Italy is such a significant part of the Eurozone economy that it can call the shots if only it dares. And that says it all really. The financial markets, aided and abetted by Brussels, want things on their terms, which are clearly detrimental to the interests of the Italian people. The Italian government has a responsibility to defend the interests of the Italian people. The Eurozone is structured to advance the aspirations of capital and undermine the responsibility of the elected Member State governments. That violates democracy and is a recipe for long-term failure. I will write more about this as the drama unfolds. I hope the Italian government holds its nerve. Wednesday, October 3 – Galway – Reclaiming the State Workshop – Harbour Hotel, New Dock St, Galway. The event will be chaired by Professor Terence McDonough. Organiser: Desmond Greaves Annual School. Thursday, October 4 – Dublin – Reclaiming the State Workshop – at Wynn’s Hotel, 35-39 Abbey Street Lower, North City, Dublin 1, D01 C9F8. The event will be chaired by Dr Karen Devine from Dublin City University. Friday, October 5 – London – Launch of the The Gower Initiative for Modern Money Studies portal. Location: The Diskus Lecture Theatre, Unite the Union, 128 Theobalds Road, WC1X 8TN London. Registration for the Launch is from 12.30 for a 13.00 start. Registration for the workshops is from 1600 onwards for a 1630 start. There are a limited number of places. The launch is free, seminars have a nominal charge of £7.50. Booking is separate for the two sessions. Refreshments will be available. At the Launch, I will be joined by Randeep Ramesh, Chief Leader Writer for The Guardian, who will he talking about the role of our media in shaping our economic narrative. Sunday, October 7 – Lisbon – Details to follow. I will be talking about the Job Guarantee and UBI. Saturday, October 13 – Wurzburg, Germany. Makroskop event. The workshop runs from 9:00 to 18:00 with several speakers discussing aspects of currencies. The fantastic US guitar player and singer/songwriter – Otus Rush dies on Saturday (September 29, 2018) at the age of 84. Here is an NPR report of the death (September 30, 2018) – Otis Rush, Chicago Blues Legend, Dies At 84. Here he is doing the classic song – All Your Lovin’ – a beautiful minor key blues. Try to work how he gets so much tremelo with his fingers (and no tremelo bar on his guitar). It is a very difficult skill to master. Otus Rush introduced that sound and many (including yours truly) copied it. This guy provided the blueprint for many of the great guitarists that came along in the mid- to late-sixties – Eric Clapton, Jimmy Page, Peter Green, Buddy Guy, Carlos Santana and a bit later still Stevie Ray Vaughn. While I was out running early this morning along the Hudson River Park and thinking about all the great songs that Otus Rush had given us and his beautiful playing, I saw a sign – Hard Road. I didn’t know what it meant but I took it as a sign. The auto suggestion that followed had me thinking about the album – A Hard Road – from the John Mayall and the Bluesbreakers, which came out in 1967. My original copy from the late 1960s is still on my play list although I have since purchased the digital version. The record was the first John Mayall released after Eric Clapton left the band and was replaced by Peter Green, just before he also took off to form Fleetwood Mac. For guitar buffs, this song – The Supernatural – was a D minor piece of reverb magic from the best of the guitar players around then – Peter Green. Peter Green was strongly influenced by Otus Rush. Thanks Bill for taking me down memory lane. Otis Rush appears to have had a heavy impact on modern blues guitarists. Not as original or talented as Jimmy Hendrix, but nevertheless a superb guitarist. I remember my late brother talking about Otis and I never realised then how talented this man was! Have a safe trip to Dubln and when you hit Dublin play some Rory Gallagher.I was a big fan of Rory’s in the 70’s and have some of his early recordings. Actually I suspect a more likely outcome is that the schoolyard bully forces an ECB-face-saving compromise on Italy. Maybe a c.1.5% deficit or some other arbitrary number that magically allows the ECB to continue its support? As a fan of Italy, having lived in Turin for over 10 years in the 1970’s I really hope that they hold their nerve indeed. I believe MMT has a decent foothold there so maybe we can have some hope for this. According to the publisher Southbank Investment Research (who make their money out of investment advice) this is going to trigger a collapse of the euro. They calculate that the Italian budget is seriously underestimated if they are going to initiate the spending programme they propose, and that the fiscal outcome will be more like 7.5%. That would force the ECB to issue euros in order for the Italians to meet their Target2 commitments – or not, in which case it would cause the Italian banks to collapse. Of course you do have to go beyond the paywall to find out how they suggest their readers can cash in on the situation, or at least limit their losses. I don’t follow. As written, the above is gobbledygook. I heard in interview US government dude said they are targeting deficit of 4,5% of GDP, calling it an investment. US is an MMT country, meaning they are trying to balance the economy, not the budget. I gather that Italy will hold out for 2.4% this year, but reduce the deficit by 0.2% each year for the following two years. especially in a country that’s been in the economic doldrums for so long? They could probably benefit from 6% now. Just curious, but could the Federal Reserve serve as an interim central bank for Italy aif it decides to restore its original currency? As near as I can tell, the Federal Reserve in effect served in that capacity for a number of European countries during the GFC. “The allowable threshold is 3 per cent of GDP. And Italy has been in breach of the 60 per cent debt target for years so it is ridiculous to start imposing sanctions as a result of that on-going departure from the rules.